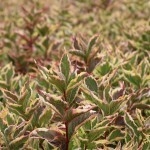 A rounded compact shrub with green and creamy-white variegated foliage. 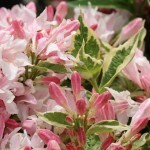 Blooms in the spring with trumpet-shaped flowers that are pink with pale pink-white centers. Attractive to hummingbirds and butterflies. It prefers full sun and an average, well-drained soil. Prune after flowering as needed.